I was transfixed by the enormity of the sandwich (and its name), but my wife noticed the calorie saving hint in smaller print at the bottom: "Even better with a Diet Coke and fresh lime." If you're going to eat something like that, why bother with a DIET coke!?!? Just go for it and get the regular Coke (or at least a Cherry Limeade). I was guessing at least 1000 calories for this bad-boy, but it totals a mere 710 calories (complete nutritional data below). What, you think you have to go to Philadelphia to get a quality cheesesteak? Just swing by any SONIC® (including the Philadelphia locations) and order a big, hearty, meat-lovers sandwich—juicy steak smothered with smoky cheddar cheese, crispy bacon, grilled onions and mayonnaise. 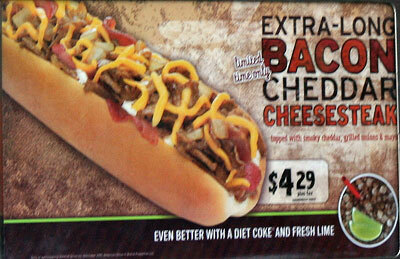 Only SONIC® makes it extra long. Because we know that the regular amount of flavor just won't cut the mustard ... I mean mayo. There's no mustard. Forget I mentioned that. As we were driving away, sipping our excellent Cherry Limeades, we made another observation: no other fast food restaurant comes anywhere close to offering the variety of drinks that Sonic does. We love it. Sonic Drive-In's Extra-Long Bacon Cheddar Cheesesteak has 710 calories, 360 calories from fat, 40 grams fat, 13 grams saturated fat, 1 gram trans fat, 100 mg cholesterol, 1030 mg sodium, 52 grams carbs, 3 grams fiber, 7 grams sugars, and 35 grams protein. Surprisingly, the steak in those Phillies are pleasingly non-plumpifying. The mayo slapped on them sort of puts a damper on the whole steaky taste, but hey. To each his own, eh? I think that maybe the variety of drinks, and by extension the versatility of the entire menu (served all day, willingness to alter recipes), is Sonic's stronger point. But the names they keep giving these interesting foods make it very difficult to read back effectively. Extra-long Bacon Cheddar Cheesesteak, that's 9 syllables. No wonder it costs almost $5!! Perhaps the Sonic sandwich is good, but it is NOT a Philly Cheesesteak. Being from Philly, I can tell you that genuine cheesesteaks are not made with "smoky cheddar cheese," but with Provolone. They also do not have bacon or mayonnaise. Also, please check your grammar. You mentioned the "enormity" of the sandwich. Look it up! "Enormity" means "great evil," but a lot of people mistakenly use it when they intend "enormousness" for great size. wow, poor anonymous misses out on both claims. Go to Philly and you'll get your cheesesteak with orange cheese unless you request provo. Wendy's social "hot, juicy burgers"